Proton is the one thing that can divide Malaysians. Some love it, some hate it, but whatever it is, there is no doubt that Proton remains one of Malaysia’s biggest achievements in a time where our struggling economy was fighting to gain a foothold in the world. For this year’s 60th Merdeka Day, we decided to revisit the history of Malaysia’s very own national car, from the time of its inception up until today. July 1979: Malaysia was under the leadership of Prime Minister Tun Hussein Onn, with Tun Dr. Mahathir as Minister of Trade and Industry. A strong believer the heavy industries is necessary for Malaysia to progress, Tun Dr. Mahathir called for a feasibility study for a Malaysian-built car. October 1981: The late Yohei Mimura, the-then President of Mitsubishi Corporation, was invited by Tun Dr. Mahathir to participate in Malaysia’s national car project. January 1983: Tun Dr. Mahathir visited Mitsubishi’s Okazaki plant to view two proposed designs by Mitsubishi – codenamed LM41 and LM44. 23-May 1983: Agreement signed between HICOM, Mitsubishi Motors Corporation and Mitsubishi Corporation to kick-start the Proton project. To show its commitment to Proton, Mitsubishi Motors promised to gradually exit from Malaysia’s passenger car market to avoid competition with Proton. Sales of Pajero 4×4 models remained. July 1983: Public invited to suggest a name for Proton’s first car. December 1983: The F (final) prototype Proton car, codenamed Perkasa, was completed in Japan. 24 F prototypes were built. It was based on a Mitsubishi Lancer Fiore. April 1984: Proton prototypes send to Malaysia for durability testing on Malaysian road and weather conditions. November 1984: The P (production) prototype was signed off in Tokyo. A total of 12 P prototypes were built. 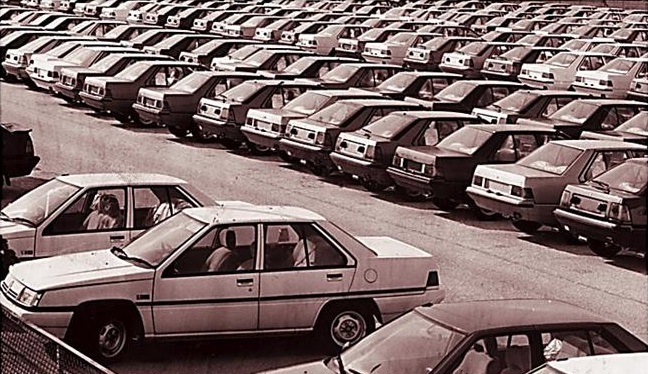 January 1985: Trial production started at Proton’s newly constructed Shah Alam plant. June 1985: A total of RM405.4 million was spent by HICOM to get the national car project going. 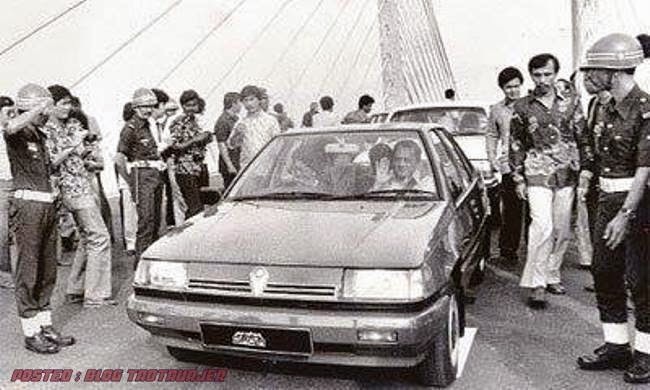 9-July 1985: The first production Proton Saga, bearing registration number Proton 1, was given to the-then Yang DiPertuan Agong Sultan Iskandar of Johor. Tun Dr. Mahathir, as witnessed by the media, test drove a metallic blue Proton Saga 1.5S around Proton’s test track in Shah Alam. Full specifications and pictures of the Proton Saga made public. Prices will only be announced during its commercial launch in August. 8-August 1985: Two Proton Sagas bearing registration number BCH 1351 and BCH 1352, started on a three week ‘Sagarama’ nationwide drive across Malaysia, including an airlift to Sabah and Sarawak, as part of a month long pre-launch teaser campaign to demonstrate the durability of Proton cars, which completed the 4,109 km drive without breaking down. 28-Aug 1985: Proton’s starting price announced – RM17,575 for 1.3S and RM19,005 for 1.5S. 1-September 1985: Tun Dr. Mahathir became the first paying customer for a Proton Saga when he took delivery of a metallic blue Proton Saga 1.5S, bearing registration number Proton 1001, as a gift to his wife Datin Seri Dr. Siti Hasmah. March 1989: Export to UK begins, achieves 5,000 sales within just six months. In comparison, Hyundai took 1.5 years to achieve the same. The UK-specifications Proton Sagas feature a different dashboard to comply to European environmental and safety regulations, and an optional sunroof. 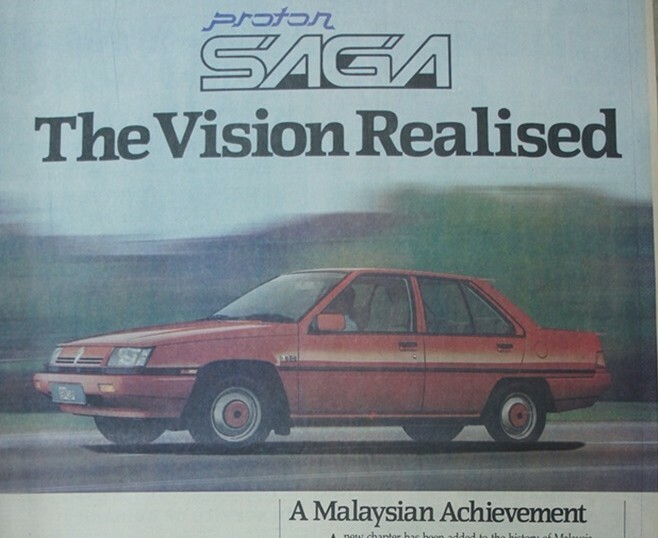 March 1989: Britain’s Daily Mail voted Proton Saga as Top-10 economy cars in the UK, beating Hyundai Pony. 21-May 1993: Proton Wira launched, with a six-month waiting period. 1994: Proton outsold Hyundai and the Volkswagen-owned Seat in UK for two consecutive years, becomes one of UK’s fastest growing brand. 1994: Proton becomes the only non-European car manufacturer selected by the British Home Office to supply cars to the British police force. Image from Flickr. 30-October 1996 – Proton acquires Lotus Group. December 1999: AutoCar UK and Evo UK rated Proton Satria GTi to be better than a Peugeot 206 GTi. 2000 – 2007: Proton continues to manufacture new car models, namely through the launches of Proton Waja, Proton Perdana V6, Proton Gen.2, Proton Satria Neo, Proton Savvy, Proton Persona. 18-January 2008: After multiple facelifts (Saga Magma, Saga Megavalve, Saga Iswara), the Saga was finally replaced by an all-new model, commonly referred to as the Saga BLM. 2009 – 2012: Proton Exora and Proton Preve launched. January 2012: DRB-Hicom acquires a 42.7% stake in Proton Holdings, in a transaction between Khazanah Nasional and DRB-HICOM which totalled RM1.2 billion. 2013 – 2014: Proton Suprima S and Proton Iriz launched. May 2017: DRB-HICOM announced plans to sell a 49.9% stake in Proton and a 51% stake in Lotus to China automotive manufacturer Geely Automobile Holdings. Whatever lies ahead for Proton, we only want to wish them the best as they continue to fly Malaysia’s flag high around the world. We at TOC wish all Malaysians a Happy Merdeka Day!